Occupation: Detective, writer and presenter of "Mystère's Mystèries" television show. Powers/Abilities: As well as being a superb athlete, and an expert in many fields of science, the occult and history, Matrin is armed with a powerful, nearly unique ray gun, "old of a thousand years" which can temporarily paralyse those it hits. The same being who gave him this gun also gifted him with a "third eye", allowing him a sort of psychic vision which gives him a new perception of the world - the full extent of this vision has never been made clear. History: Martin Mystère investigates the greatest mysteries of the world, finding out who really built Stonehenge, the true identity of the Man in the Iron Mask, what actually caused the Tunguska Blast of 1908, and the true nature of the Werewolf, the Vampire, the Golem and the Loch Ness Monster. He has encountered King Arthur, unmasked Santa Claus, and read the Necronomicon. His partner in investigations is Java, a Neanderthal man from "The City of Ethereal Shadows", a hidden kingdom in the Mongolian mountains. Comments: Created and written by Alfredo Castelli. Between 1978 and 1981 he published a series in the weekly magazine Supergulp whose lead character, Allan Quatermain, the grandson of the famous explorer of the same name, investigated cases of the supernatural and similar mysteries (much as Martin Mystère would subsequently do). 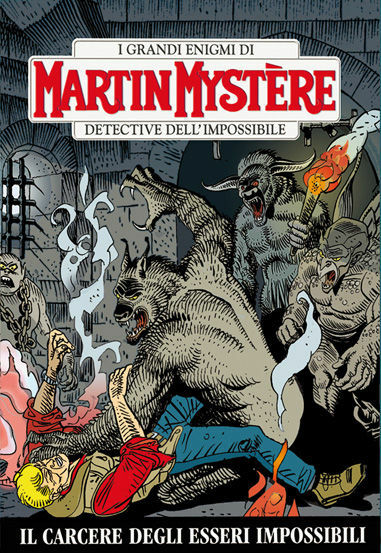 When Supergulp ceased publication, Castelli suggested to Segio Bonelli Editore that they continue the series. They agreed, and it was relaunched with the lead character initially renamed Doc Robinson, and then Martin Mystère. He is known as Martin Y in his English reprints, and has been published by Dark Horse in the U.S. as Martin Mystery. Jim Bowie, a hero who in 1836 resisted the siege of Mexicans at Fort Alamo, is also known for the knife that bears his name. The "Bowie Knife", with his long knife from unmistakable, has become a legendary weapon of the West, the original knife owned by Jim said it had been forged by a mysteriosa rock from space. A discovery made in an archaeological dig in the heart of Texas could shed new light on the nature of the metal and possibly lead to a discovery far more dangerous. Martin Mystere only seems able to prevent the dark forces that seek by every means to steal the secret of the blade. Year 1945. In the forests of southern Austria, in a seemingly abandoned mine, two boys attend an event left involuntarily, and I bear the scars for the rest of their lives. 2009. Moscow. In the palace of the Lubyanka, an old German document back suddenly the light from the archives of the KGB, throwing into turmoil the Russian secret service. And for the first time in decades is whispered a name long forgotten, but that instantly evokes dismay: Arjan Bauer. A name that leaves a trail of death and Banishing the largest Olga Petrovna, forced to escape his own bosses and former colleagues, who intend to silence her forever. Olga has no choice but to seek help from an old friend with whom he had already collaborated in the past: Martin Mystery! The young Reginald navy school to meet again in Central Park with a bizarre group of individuals. Seem very common appearance of "homeless", but in reality are the teachers of a secret "Magic School", and Reggie have identified a potential new student. Indeed, it seems that the boy is the only one able to counter the arrival of a mysterious figure who comes from far away, an evil wizard who will bring destruction to our world. Meanwhile more and more people in New York, was the victim of bizarre hallucinations, leading to death. But what's really going on? Reginald's mother is determined to see clearly, and seeks the help of Martin Mystere. Fiin from the opening bars is made clear that Stella is a killer of great ability and after seeing her in action dramatized the death of his dog and the constant reference to revealing the secrets to MM (secret silly like the fact that dog buried in the garden as opposed to read) than the real secret of his ability's whole murderous smile a bit '. Subsequently, however, the story becomes a bit 'rough and loses some' consistency going to retrace too many clichés seen again. So without spot or honor. Martin Mystere is sitting alone on a bench in Porto Gruaro, waiting for someone. Mysteriosa a call to his home in New York has plunged in the Venetian town without thinking twice. But who is who called? No idea comes to mind. He reaches behind him and a kid starts talking as if he knew, and tells him to be the reincarnation of Giacomo Casanova. Martin is stunned, but the kid shows too many details of the life of a noble Venetian Casanova and known only to him. Yes, because Casanova and Mystere years before they had met and had a disserzione on topics that the young man knows very well. The Detective of you decide to help him. Following the directions given to him goes to an inn in Venice and there is catapulted in Venice in 1755. In the mirror sees an image that is not his. He lives within the body of another, a secret agent. 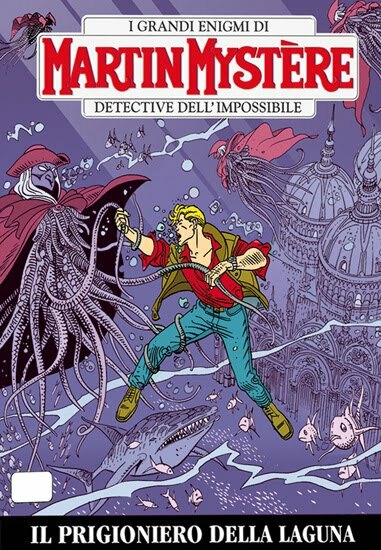 Will investigate mysterious reasons that led to prison in the original Casanova and a Mystery that takes him to the attention of a secret kept hidden under the city of Venice, hidden from the sea. A well-written story by Charles Recagno that allows us to meet once (or first? ), And investigate the mysterious beings appeared years ago on the special No. 4 Nathan Never. Venetian Drawings of the setting have strained the capacity of Coppola. Style the "Alexandrian" which, despite the difficulties, is up to the story. The bimonthly magazine has done well to historical Sergio Bonelli. The stories are edited and themes more original articles. The beauty of Martin Mystere is that even being a popular comic strip, you can read taking their breaks, without necessarily engaging in a tug only. Geneva, the European Center for Nuclear Research. It seems like a day like any other, but it is not. A particle accelerator is run for an absolutely revolutionary project, which may allow you to know the origins of the universe. But l '"Experiment of the Century" takes an unexpected turn: something unexpected and terrible appears out of nowhere, throwing in a panic the scientific community. What is the fate of the human race? It seems like a day like any other, but it is not. The lives of Martin Mystère and his wife Diana change it forever, in a street near Broadway where he place an absurd tragedy .. Thank you very much, Admin, Roy,İki. The love and care that goes into these scans is obvious.